When Bell’s palsy occurs, all branches sustain damages from compression or disrupted blood supply to the trunk of the facial nerve. We will discuss the mechanisms of damages in Part 2. 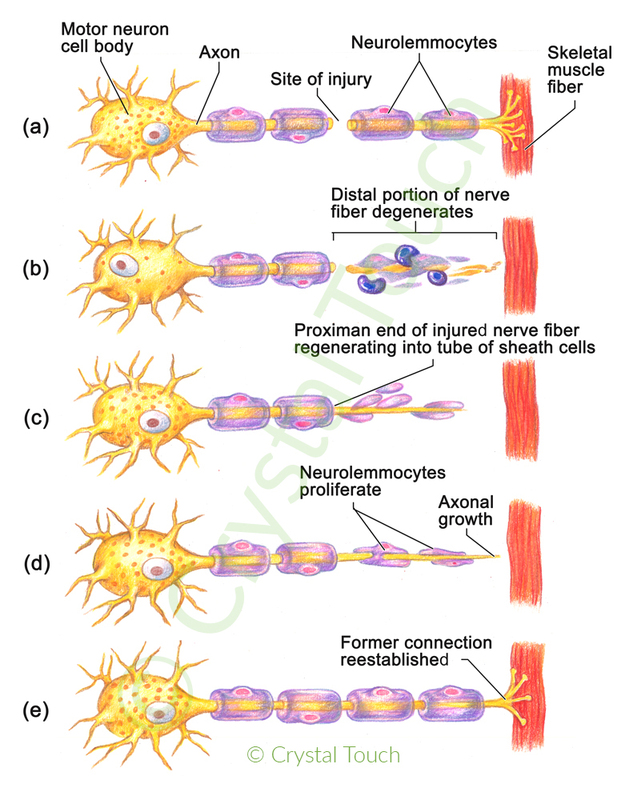 The regeneration speed of the damaged nerve fibres (axons) is not the same for all branches. For this reason functions of facial muscles do not return all at the same time. Sometimes the eyelid closing returns first, in other cases it can be the mouth corner movements or the eyebrow lifting. Construction of a motor neuron was discussed in the previous post “Facial nerve – a cable with 10,000 wires”. As the nerve fiber (axon) makes part of a living cell, it is susceptible to damage by mechanical compression or from disruption of blood supply. Peripheral facial paralysis (Bell’s palsy) develops usually within several hours, sometimes within a couple of days. At this stage it is crucial to put “all hands on deck” and fight the cause of damage – viral infection, swollen tissue or vascular spasm. 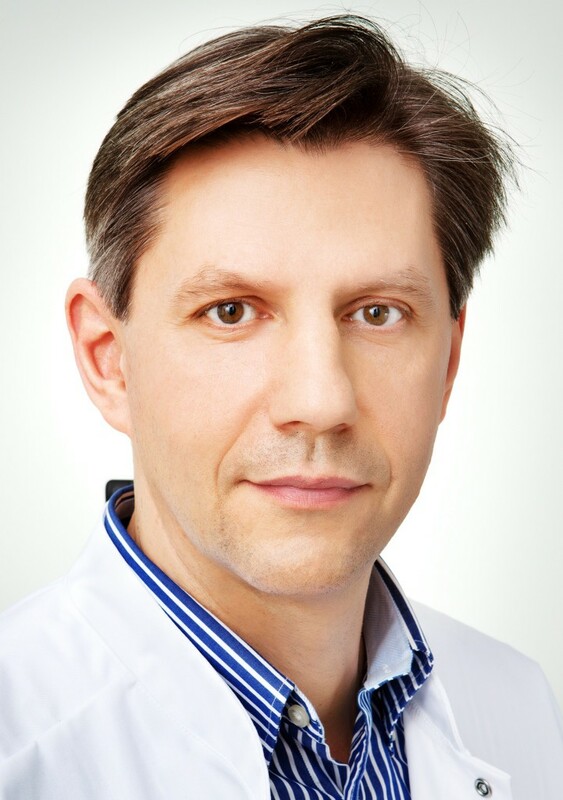 Within the first 1-3 days of the nerve compression or ischemia, the so called Schwann cells that provide electrical insulation of the axon, die. Conduction of mimetic signals between the brain and facial muscles stops. This is called a “conduction block”. At this stage the damage to the nerve is still minimal and if handled promptly, the new Schwann cells will regrow and restore the electrical insulation of axons. A complete spontaneous recovery in such cases can take place within 3 to 5 weeks. If the damaging factor persists longer than 4-6 days, the axon (conducting wire) dies, and axonal degeneration progresses. Now there is no physical connection between the brain and facial muscles any more. Axons have to regenerate all the way from cite of the damage to the facial muscles. Usually it is a distance of 9-10 cm. Under the best conditions, the speed of axonal regeneration does not exceed 1mm per day. It can take up to 3 months before the first facial movements reappear. 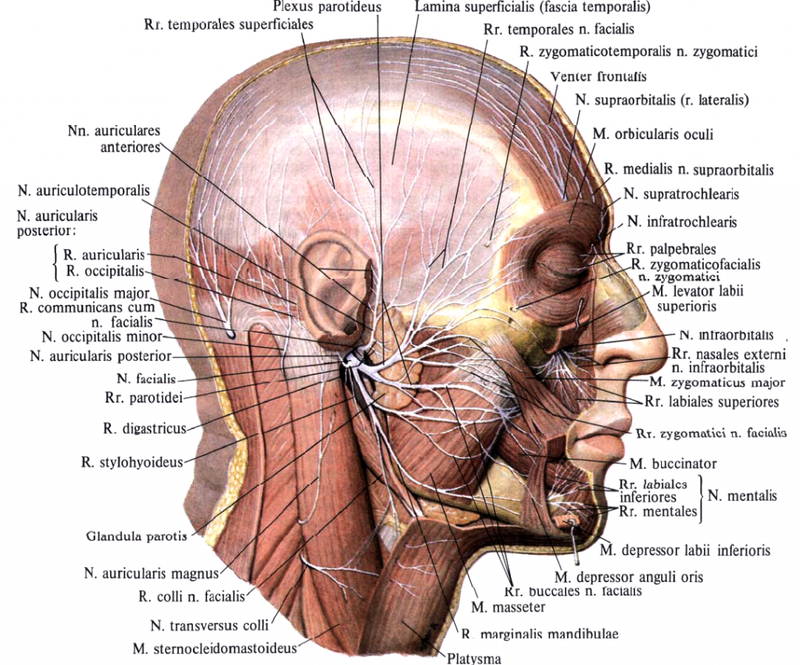 As soon the damage to the facial nerve has occurred, our body starts the regeneration process. It needs to re-grow about 7000 axons (“wires” or nerve fibers), and also recover their electrical insulation (myelin sheath). As soon as the axons begin to reconnect to the facial muscles, we start feeling slight twitching, itching, vibration or similar sensations. These are all good signs. Soon after that, the facial movements begin to come back. Long before the normal mimetic movements reappear, the “tone” of facial muscles returns. Then in the neutral state the face looks (almost) symmetrical. Asymmetry becomes clearly visible only during speech or emotions. It is hard to say, which movement will come back first. Often the closing of the eye and the small movements of the mouth corner return sooner than other muscles’ functions. From my experience, in most patients the eyebrows lifting (forehead muscle) is the last one to recover. The reason for this is unknown to me. The nerve fibers grow rather slowly – 1mm per day. Sometimes the regeneration of certain nerve fibers stops half-way. They do not reconnect to their target-muscles. Then only part of the muscle regains its functions. This results on one hand in the muscle weakness, on the other – to muscle contractures, due to “overworking” of the few recovered fibers. It is of great importance to do the GENTLE facial massages several times per day during the whole recovery period. This stimulates the nerve regeneration and prevents contractures. Another complication of the slow recovery after Bell’s palsy is synkinesis. Synkinesis is the involuntary contraction of those facial muscles that are not normally involved in a particular mimetic movement. For example, involuntary closing of the eyelid during speech or during smiling. Another common synkinesis is the movement of the mouth corner as one blinks or squeezes the eyes.